The City of Sitka dealt with a messy situation Friday when a vital part of the sewer system failed. The Thomsen Harbor Lift Station was down for 36 hours, meaning all raw sewage on Baranof Island had to be diverted into the harbor so it wouldn’t back up into homes and businesses. Quick thinking crew members and local businesses were able to cobble together a solution. If all roads lead to Rome, all sewer pipes — at least on the Baranof Island side of Sitka — lead to the Thomsen Harbor Lift Station. The facility is underground. Environmental Superintendent Shilo Williams peers over the edge of a hole in the ground, lined with pipe painted light blue and a ladder. “Underneath this can is a whole room that houses three very large pumps,” Williams said. That room, known as the dry well, also houses the electric equipment necessary to power the pumps that move Sitka’s sewage off Baranof Island to a treatment plant on Japonski Island. Around 4:45 a.m. Friday morning, one of those three pumps broke apart. “This dry well, which is never supposed to be wet, started filling with sewage. And it knocked out of all the equipment. The lift station was completely dead,” Williams said. The water was rising fast. Williams says it was several feet high by the time a flood light went off and facilities operator Bob Reid arrived. “This was a catastrophic failure. We’ve never had anything like this happen before,” Williams said. “I will say that the crews handled it impeccably. The repair couldn’t have gone any smoother, any faster, any better than it did. Williams is unmistakably proud of her crew, who worked around the clock to get the situation under control. That included salvaging equipment submerged in sewage and giving the dry well a thorough cleaning. It was messy, back-breaking work. When asked how her crews managed to deal with the smell, Williams chuckled. 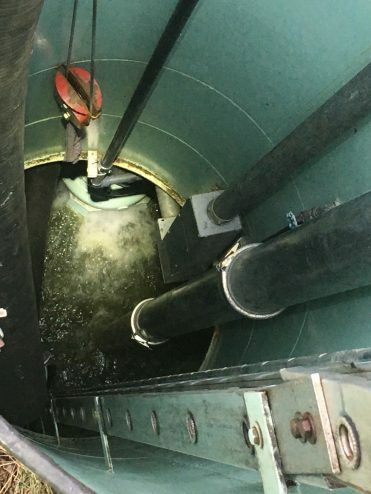 To prevent that river of sewage from backing up into homes and businesses, crews temporarily redirected the wastewater towards a storm drain and into the harbor. The pollution posed an environmental concern and City and Borough of Sitka issued a PSA calling for Sitkans to limit their toilet flushes and shower times until further notice. Williams said that conservation effort made a difference throughout the 36 hours the lift station was ultimately down. 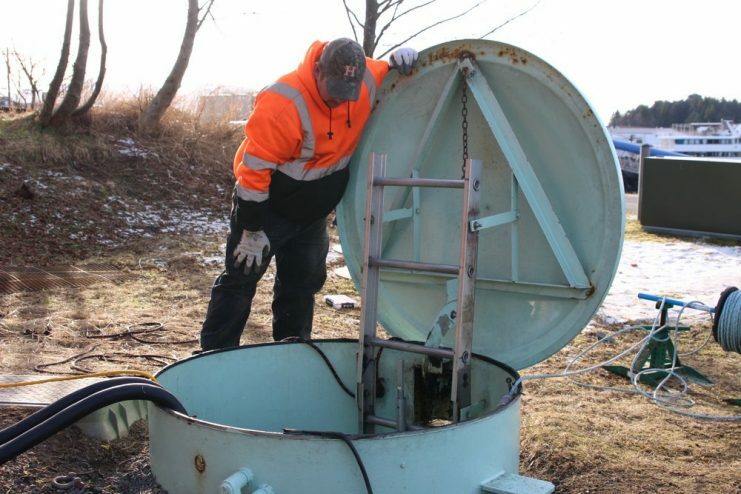 She estimates 800,000 gallons of raw sewage entered Thomsen and Eliason harbor in that time. “I know 800,000 gallons sounds like a lot, but in the scheme of things, into the water it’s discharging into…it could have been a lot worse,” Williams said. The Alaska Department of Environmental Conservation and other environmental agencies were alerted to the situation. Come Saturday morning, the city had some lucky breaks. It didn’t rain, so sewer flow was low. The two remaining pumps dried out. Crews were able to restore the sewer connection by 5 p.m. that evening. That’s in large part due to the work of Sitka Electric and Boreal Controls of Juneau, installing new electrical equipment above ground. Parts aren’t easy to come by on an island of 9,000 people, so equipment had to be expedited through Alaska Airline’s GoldStreak program or plucked from surrounding facilities. With the nightmare over, Williams has begun to investigate what went wrong. She suspects that gravel is the culprit, which naturally accumulates over time and may have slowly chewed away at the pump. Despite its age and importance, the Thomsen Harbor Lift Station is not high on the city’s punch list for public works projects. The 2012 Municipal Sewer Master Plan suggests upgrades in 10 to 20 years. The recent failure has kickstarted a conversation about what can be done sooner and the city has ordered a new pump. Now that electrical equipment has been installed above ground, away from potential flooding, Williams said she’d like to see it stay there.